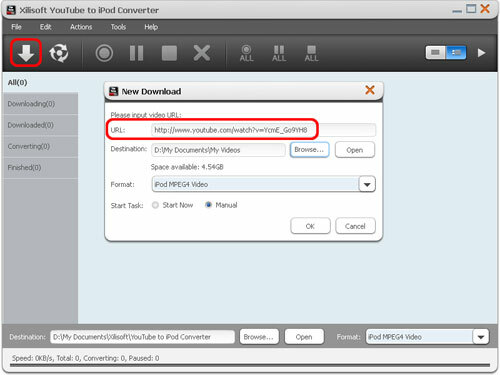 The guide below will show you how to download videos from www.youtube.com and convert them to iPod/iPhone video files with Xilisoft YouTube to iPod Converter step by step. 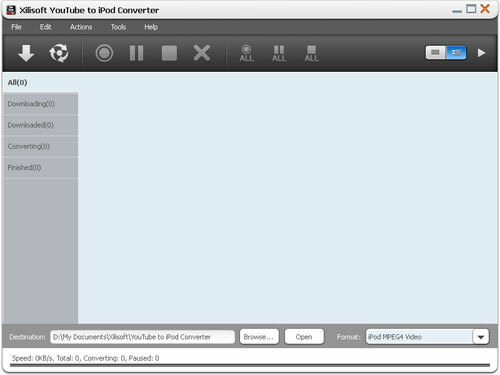 At first, download, install and launch Xilisoft YouTube to iPod Converter. Below is the first interface after launch. visit www.youtube.com with Internet Explorer browser and browse YouTube videos. Click "New Download" button on the toolbar to open the "New Download" dialog, and copy the URL of the YouTube video you want, then paste it into the "URL" textbox. 1. You can also drag and drop the video URL directly to the main window or to Drop Zone to create a new task. 2. 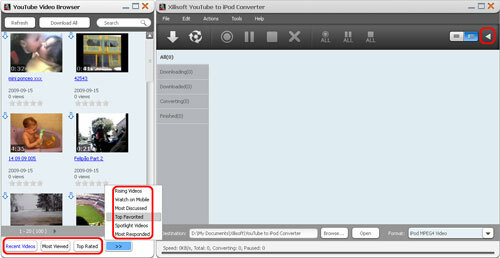 Right click the YouTube video thumbnail or URL, and select "Download with Xilisoft YouTube to iPod Converter" option from the right-click menu, then the "New Download" dialog appears, and the video URL is automatically added into the "URL" textbox. Adjust the Destination, Format and Start Task options in the "New Download" dialog above. Destination: Click "Browse" button to open the "Browse For Folder" dialog box to select a folder for saving the output YouTube videos. You can check the folder's available space below the "Destination" field. Format: Select an iPod/iPhone output format you want from the "Format" drop-down list. If you only want to save the original FLV video, then choose "FLV" as target format. Start Task: The "Start Now" option is selected by default. If you don't want to start the new task promptly after clicking "OK" button, then set the option as "Manual". Click "OK" button to close the "New Download" dialog, then click "Start" button on the toolbar to start the task. If you set the "Start Type" option as "Start Now", then the selected video will be promptly downloaded and converted to the format you choose and saved to the folder you set in the Step 3. Click "Tools > Settings" option from the main menu to open the "Settings" window, then click the "Task" tab and set the "Destination", "Format" and "Start Task" options in the "Task Default Configuration" area according to your own requirements. Click "Browse videos" button on the toolbar or click "Tools > Browser..." option to open the "YouTube Video Browser" window, and use the filter buttons at the bottom to browse the YouTube videos by different categories: Recent Videos, Most Viewed, Top Rated, Most Responded, Spotlight Videos, Top Favorite, Watch on Mobile, Most Discussed and Rising Videos. 1. You can search for the videos you're interested by typing the keyword into the "Search" textbox and clicking the magnifier button at the right. 2. Click the link below the video thumbnail, or right click the video thumbnail and click "Play" option from the right-click menu to open the web page with your default web browser and watch the YouTube video online. Click the down arrow at the left top of the video you want, or drag and drop the video into the main window, or right click the video thumbnail and click "Download Video" option from the right-click menu to create a new task, then click "Start" button on the toolbar to start the task. If you set the "Start Type" option as "Start Now", then the selected video will be promptly downloaded and converted to the format you choose and saved to the folder you set in the Step 1. Click "New Convert" button on the toolbar to open the "please choose the files for convert" dialog, then choose FLV files you want and click "Open" button to close the dialog and return to the main window. The selected FLV videos will be added into the file list. Click "Start" button on the toolbar to start the task. If you set the "Start Type" option as "Start Now", then the selected video will be promptly converted to the format you choose and saved to the folder you set in the Step 1. 1. If your Internet Service Provider blocked YouTube site, you can bypass the firewall by setting the proxy server as below: Open the "Tools > Settings > Proxy" tab, choose the proxy server type, enter the address and port of the proxy server, and if necessary, enter the user name and password, then click "OK" button to return to the main window and retry the downloading. 2. You can click "Start All" button on the toolbar to start downloading and converting all the files in the file list, and control the converting process by the "Pause", "Stop", "Pause All", "Stop All" and "Remove" buttons. 3. There're two modes to view the files in the file list: list and thumbnails. Click the "List" and "Thumbnails" buttons to switch the view mode. 4. If you set the "Start Type" option as "Manual", then before you start the new task, you can change the destination and format freely.